“‘Terminal Stupidity’: Graft Zeppelin and Trump Sky Alpha,” forthcoming in Trump Fiction: Essays on Donald Trump in Literature, Film, and Television, ed. Stephen Hock (Lexington Books, 2019). English translation of Hans Blumenberg’s “Eine Meinung müsste man haben!”, forthcoming in The APA Blog of the American Philosophical Society (2019). “The Gravity of the Situation,” forthcoming in The Anthology of Babel, ed. Ed Simon (Punctum Press, Spring 2019). “Don’s Dirigible: Mark Doten’s Trump Sky Alpha, forthcoming in the Cleveland Review of Books (2019). Translation of Hans-Georg Gadamer’s “A ‘Socratic’ Dialogue,” in The APA Blog of the American Philosophical Association (November 2018). “‘Fascism is Capitalism Plus Murder’: On Jason Stanley’s How Fascism Works” in the Cleveland Review of Books (September 2018). “The Happy Meal at The Seven Gables,” in the “Mondays Are Murder” series by Akashic Books in Brooklyn (October 2018). “Our Astaire of the Mind,” (October 2018) in Rowan Magazine. “Socrates Talks Tennis,” in The APA Blog of the American Philosophical Association (August 2018). “Murder in the Vicarage: Žižek’s Chesterton as a Way out of Christianity,” in Slavoj Žižek and Christianty, ed. Sotiris Mitralexis and Dionysios Skliris (London: Routledge, 2019): 188-198. 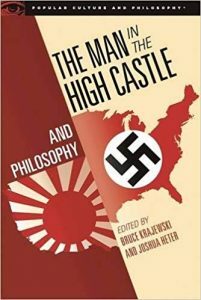 “What If Your Hero a Fascist?” in The Man and the High Castle and Philosophy, ed. Bruce Krajewski and Josh Heter (Chicago: Open Court Press, 2017): 71-80. Interview about Hans Blumenberg’s Work on Myth with Professor Mohamad Sharitii from Today’s Culture / Farhang Emrooz (online journal based in Tehran): read article in Persian; English version. June 2017. “Žižek on Ideology as Not Seeing, Or, The Eyes (Don’t) Have It” in Putting Theory into Practice in the Contemporary Classroom, ed. Becky McLaughlin (Newcastle, UK: Cambridge Scholars Publishing, 2017): 33-55. “Hermeneutics and Politics” in The Blackwell Companion to Hermeneutics, ed. Niall Keane and Chris Lawn (Wiley Blackwell, 2016): 72-75. “Hermeneutics and Rhetoric” in The Blackwell Companion to Hermeneutics, ed. Niall Keane and Chris Lawn (Wiley Blackwell, 2016): 539-547. Conversations: The Journal of Cavellian Studies #4 (2016). “Righteous Deception: Response to Kastely’s The Rhetoric of Plato’s Republic” in Advances in the History of Rhetoric 19.3 (2016): 348-51. “Lady Oracle: Engagements with Jan Zwicky’s Lyric Philosophy” in Common Knowledge, 20.1 (2014): 46-54. “The Dark Side of Phronesis: Revisiting the Political Incompetence of Philosophy,” in Revista Classica (Brazil’s journal for Classical Studies) 24 1/2 (2011): 7-21. “The 2011 Mind Set of Faculty” in the Chronicle of Higher Education (21 August 2011). “Microcosmographia Administrativa: Being an Incomplete Set of Etiological Considerations” in the Times Higher Education Supplement (8 October 2009): 34-38. “Rhetorical Conditioning: The Manchurian Candidate,” in The Terministic Screen: Rhetorical Perspectives on Film and Film Theory, ed. David Blakesley (Carbondale, IL: Southern Illinois University Press, 2003): 213-233. “Wittgenstein’s Remarks on Colour as Remarks on Racism,” in Feminist Interpretations of Ludwig Wittgenstein, ed. Naomi Scheman and Peg O’Connor (University Park, PA: Penn State University Press, 2002): 389-407. 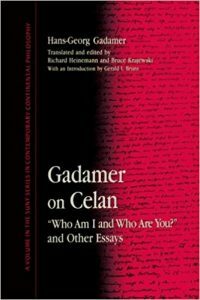 “Gadamer’s Aesthetics in Practice in Wer bin Ich und wer bist du? ” in Maps and Mirrors: Topologies of Art and Politics, ed. Steve Martinot (Evanston: Northwestern University Press, 2001): 16-27. Co-translator, with David Darby, “Crowds and Power: A Conversation between Elias Canetti and Theodor W. Adorno” in Critical Essays on Canetti, ed. David Darby (New York: G.K. Hall, 2000): 137-53. “Hans-Georg Gadamer” in Encyclopedia of German Literature, ed. Matthias Konzett (Chicago: Fitzroy Dearborn, 2000): 319-21. Two articles (one on Gadamer, the other on Hermeneutics) for The Philosophy of Law: An Encyclopedia, ed. Charles B. Gray (New York: Garland, 1999): 325-26 and 367-69. “South by Northwestern: Graff’s Hitchcockian View of Multiculturalism” in Textual Studies in Canada 10/11 (1999): 213-18. “Throwing Away Ladders: Response to Sutcliffe and Faber” in Textual Studies in Canada 10/11 (1999): 227-31. “Stanley Cavell’s Political Reception: The Event Awaits,” History of the Human Sciences 10.2 (1997): 113-126. “Friedrich Nietzsche.” Article for The Encyclopedia of Rhetoric, ed. Theresa Enos (New York: Garland Publishing, 1996): 465-68. Introduction to Symposium on John Milbank’s Theology and Social Theory: Beyond Secular Reason in Arachnē 2.1 (1995): 105-8. “Wittgenstein’s Remarks on Colour as Remarks on Racism,” West Coast Line (1994): 134-46. “The Musical Horizon of Religion: Hans Blumenberg’s Matthäuspassion,” History of the Human Sciences 6.4 (1993): 81-95. Co-translator of Hans-Georg Gadamer’s “The Expressive Power of Language: On the Function of Rhetoric for Knowledge,” PMLA 107 (March 1992): 348-52. Introduction for Hans-Georg Gadamer’s “The Expressive Power of Language,” PMLA 107 (March 1992): 345-47. “Postmodernism, Allegory, and Hermeneutics in Brazil,” Annals of Scholarship 6 (1989): 183-206. Interview with John Searle, Iowa Journal of Literary Studies 8 (1987): 71-83. Bi-weekly movie review column called “Remains to Be Seen” for The Sudbury Star (1996-97). Review of Jean Bollack’s The Art of Reading: From Homer to Paul Celan in the Bryn Mawr Classical Review (April 9, 2018). Review of Hans Blumenberg’s Schriften zur Literatur: 1945-1958 (Suhrkamp, 2017) in Common Knowledge 24.2 (April 2018): 328-29.
Review of Philipp Felsch’s Der lange Sommer der Theorie: Geschichte einer Revolte: 1960-1990, (C.H.Beck, 2015) in Common Knowledge 23.1 (January 2017): 111.
Review of Hans Blumenberg’s Präfiguration: Arbeit am politischen Mythos (Suhrkamp, 2014), in Common Knowledge 21.3 (2015): 531-32.
Review of Hakan Tell’s Plato’s Counterfeit Sophists (Harvard UP, 2011) in Philosophy and Rhetoric 45.3 (Fall 2012): 343-50.
Review of Hans Blumenberg’s Paradigms for a Metaphorology (Cornell UP, 2010), trans. Robert Savage, and Blumenberg’s Care Crosses the River (Stanford UP, 2010), trans. Paul Fleming in Common Knowledge (Spring 2012): 358-59.
Review of Christina Tarnopolsky’s Prudes, Perverts, and Tyrants: Plato’s Gorgias and the Politics of Shame (Princeton UP, 2010) in the Bryn Mawr Classical Review. Review of Nancy Worman’s Abusive Mouths in Classical Athens (Cambridge UP, 2008) in Bryn Mawr Classical Review (October 2009). Review of Santiago Zabala’s The Hermeneutic Nature of Analytic Philosophy: A Study of Ernst Tugendhat in Common Knowledge 15.2 (Spring 2009): 219.
Review of James K. Lyon’s Paul Celan and Martin Heidegger: An Unresolved Conversation, 1951-1970 in Modernism/Modernity 14.3 (2007): 589-91.
Review of Bryan Garsten’s Saving Persuasion: A Defense of Rhetoric and Judgment in Bryn Mawr Classical Review (February 2007). Review of David Damrosch’s What is World Literature? 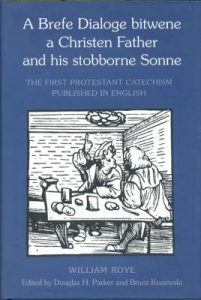 in College Literature 32.4 (Fall 2005): 234-36.
Review of Joseph Leo Koerner’s The Reformation of the Image in Renaissance Quarterly 58.2 (Summer 2005): 652-54.
Review of Jean Grondin’s Hans-Georg Gadamer: A Biography in Common Knowledge 11.2 (Spring 2005): 353.
Review of Ramona Naddaff’s Exiling the Poets. The Production of Censorship in Plato’s “Republic” in Bryn Mawr Classical Review (February 2004). Review of The Questions of Tenure, ed. Richard P. Chait in South Atlantic Review 68.2 (2003): 129-132.
Review of Anne Carson’s Economy of the Unlost: Reading Simonides of Keos with Paul Celan in Bryn Mawr Classical Review (February 2003). Review of John McCumber’s Time in the Ditch: American Philosophy and the McCarthy Era in Radical Philosophy 112 (2002): 51-53.
Review of Victor Klemperer’s The Language of the Third Reich in Modern Language Quarterly 63.1 (2002): 133-136.
Review of Nicholson Baker’s Double Fold: Libraries and the Assault on Paper in South Atlantic Review 66.4 (2001): 196-199.
Review of Literary Criticisms of Law, ed. 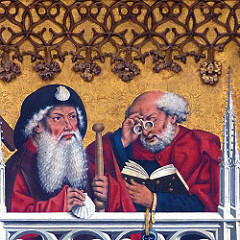 Guyora Binder and Robert Weisberg in South Atlantic Review 66.1 (2001): 205-207.
Review of Geoff Waite’s Nietzsche’s Corps/e in Dialogue: Canadian Philosophical Review 38.1 (1999): 178-82.
Review of Kathy Eden’s Hermeneutics and the Rhetorical Tradition in Rhetorica 17.1 (1999): 104-8.
Review of Hans Blumenberg’s Shipwreck with Spectator in Common Knowledge 7.3 (1998): 112.
Review of Adrian del Caro’s The Early Poetry of Paul Celan in South Central Review 15 (Fall-Winter 1998): 79-81.
Review of Rhetoric in an Antifoundational World, ed. Michael Bernard-Donals and Richard Glejzer, Rhetoric Society Quarterly 28 (Summer 1998): 102-106.
Review of Marjorie Perloff’s Wittgenstein’s Ladder: Poetic Language and the Strangeness of the Ordinary, Arachnē 5.1 (1998): 185-89.
Review of George A. Kennedy’s Comparative Rhetoric in Bryn Mawr Classical Review (Fall 1997). 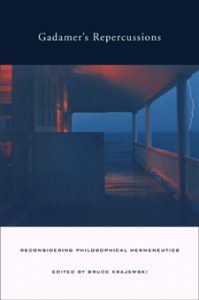 Review of Gianni Vattimo’s Beyond Interpretation: The Meaning of Hermeneutics for Philosophy, Philosophy in Review, 17, #5 (October 1997): 393-95.
Review of The Recovery of Rhetoric: Persuasive Discourse and Disciplinarity in the Human Sciences, ed. R.H. Roberts and J.M.M. Good, and Rhetoric, Sophistry, Pragmatism, ed. Stephen Mailloux, Arachnē 4.1 (1997): 227-33.
Review of Horace Fairlamb’s Critical Conditions: Postmodernity and the Question of Foundations, Philosophy and Literature 20 (1996), pp. 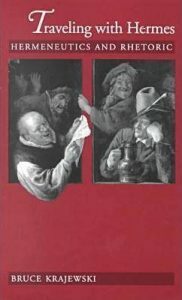 271-72.
Review of Joseph Leo Koerner’s The Moment of Self-Portraiture in German Renaissance Art in Renaissance Quarterly 49.1 (Spring 1996): 180-81.
Review of Brigitte Peucker’s Incorporating Images: Film and the Rival Arts in Arachnē 2.2 (1995): 270-72.
Review of Stanley Cavell’s A Pitch of Philosophy: Autobiographical Essays in Philosophy and Literature (Oct. 1994): 363-65.
Review of Stanley Rosen’s The Quarrel Between Philosophy and Poetry in Canadian Philosophical Reviews (August 1994): 286-88.
Review of Joseph Leo Koerner’s Caspar David Friedrich in Arachnē: A Journal of Language and Literature 1 (1994): 131-136.
Review of Stanley Cavell’s Conditions Handsome and Unhandsome in Philosophy and Literature 17 (1993): 156-58.
Review of Gianni Vattimo’s The End of Modernity in Chicago Review 37 (1991): 187-92.
Review of Stanley Cavell’s In Quest of the Ordinary in Review of Metaphysics (December 1989): 393-94.
Review of Robert Sullivan’s Political Hermeneutics: The Early Thinking of Hans-Georg Gadamer in Review of Metaphysics (December 1990): 441-42.
Review of Peter Sloterdijk’s Critique of Cynical Reason in Journal of the Midwest Modern Language Association 22 (Spring 1989): 61-64.
Review of Vicki Hearne’s Adam’s Task in Quarterly Journal of Speech (May 1988): 267-69.
Review of Joel Weinsheimer’s Gadamer’s Hermeneutics in SubStance 53 (1987): 89-91.